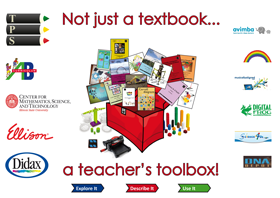 TPS Publishing and Partners have now been adopted in California, Georgia and Florida with the Creative Core Curriculum for Mathematics with STEM, Literacy And Arts. We have also been adopted in Texas with the Creative Mathematics and Creative Science Curriculums with STEM, Literacy and Arts. We are also the only adopted supplier of Forensic Science in Texas. We provide traditional, STEM and STEAM project materials aligned to the individual state requirements. Professional development courses are provided by Illinois State University Center for Mathematics and Science.